The late thirties must have been a time of transition for GM divisions. Decisions had to be made on such matters as what they would build, how would they promote station wagons, or if they should focus on selling more convertibles? The station wagons were one of the most expensive of the models, were the least popular, and cost the most to produce. That alone would have justified not building them. But production continued, and thank goodness or our enjoyment of woody wagon history might have been entirely altered. Hercules was a major supplier of wagon bodies for all GM divisions during the later thirties. Preferred wood-style was blond for the bodywork, using light-toned ash framing and birch panels. The Pontiacs in 1937 and 1938 were virtually unchanged, except for three features: some tech specifications, the hood side-panels, and the rear window in the middle of a canvas or paneled back window treatment. This was the age when optioning on brand new cars became popular. You could order fog lights, electric windshield defoggers, right-hand tail lamps, anti-freeze, fuel pump vacuum boosters, and even a rather strange, “third passenger gearshift” option. 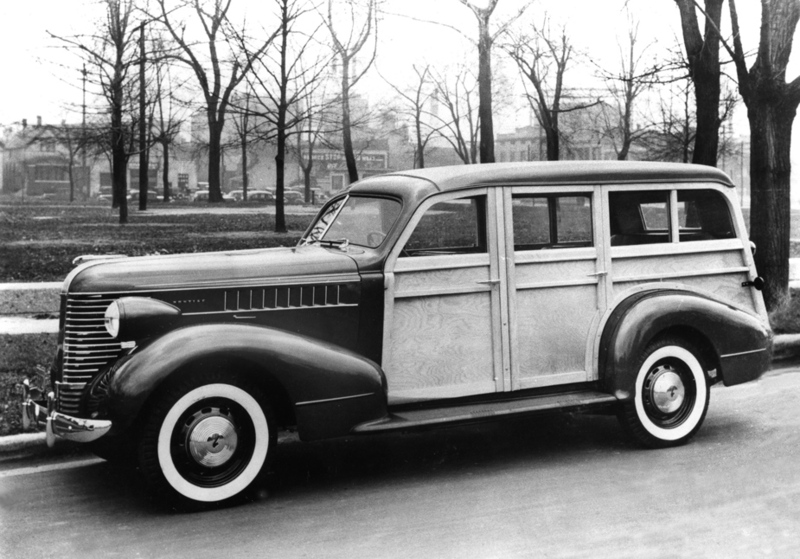 The Model 26 wagon used the production 117-inch sedan chassis and 85 horsepower inline, six-cylinder engine. Pontiac also offered a Series 28 model with an eight-cylinder engine, on a longer 122-inch chassis, but a wagon is not listed as an option. No doubt one could have been ordered, if a customer insisted. Price listing for this year model shows that the Model 26 wagons listed FOB Detroit at $1,110. It is thought that less than 2,000 wagons (1937-38) were built at the Hercules Evansville, Indiana plant, along side station wagon bodies for Packard, Oldsmobile and Chevrolet. This official Hercules PR photo was shot near an Evansville, ID park in the winter of 1938.